Traffic calming is the combination of mainly physical measures that reduce the negative effects of motor vehicle use, alter driver behavior and improve conditions for nonmotorized street users. In this State of the Practice report, route modification, traffic control devices, and streetscaping were distinguished as being separate from traffic calming. In many cities, however, these techniques (as well as education and enforcement) are also included in traffic–calming programs. Figure 20–1 shows schematic examples of traffic–calming devices and elements. Figure 20–1. Illustration. Examples of traffic–calming elements. 20.6 Putting the Design Techniques to Work: Selected Examples of Traffic Calming. 20.8 References and Additional Resources. Improved pedestrian and bicyclist safety. Improved neighborhood cohesion and livability. Improved street aesthetics and appearance (see figure 20–2). Figure 20–2. Photos. Traffic–calming devices are used to break up long, uninterrupted street vistas that encourage speeding. When any new traffic–management approach is introduced, issues, concerns, and questions are bound to arise. Design decisions related to traffic can have far–reaching consequences. Lives, economic well–being, and urban livability are directly affected. Professional engineers, planners, government, and the public all are aware of and sensitive to proposals for changes in the traffic environment. Roadway congestion, air quality, traffic safety, street crimes, and the high cost of new improvements are among the most widely debated issues in America today. New design ideas are, and should be, subjected to rigorous testing and evaluation before being accepted as part of the standard engineering and transportation–planning tool kit. Traffic calming is not a cure–all for urban transportation woes, but it can have significant benefits in many situations. It is also important to consider the overall context of a traffic concern before the decision is made to implement traffic–calming techniques. In many cases, traffic–calming measures are installed to treat an area with a traffic problem, but the cause of the problem is not considered. There may be, for instance, a problem on a major arterial (such as an intersection with poor signal timing) that is backing up traffic and causing motorists to take alternative routes through adjacent residential streets (see figure 20–3). Adding traffic–calming devices to control speeds and volumes along the minor roadways would not be necessary if the source of the problem (the signal timing on the principal arterial) were corrected. In other words, transportation planners and engineers should look to treat the disease—not the symptom—of poor traffic management. Figure 20–3. Illustration. Traffic calming may not be necessary if the original problem is corrected. Fire and emergency services personnel should be consulted in the early stages of traffic calming programs (see figure 20–4). Their input into the type of location of traffic calming will ensure that emergency response times are not being significantly affected. Their support and acceptance of traffic calming may also tend to foster public support as well. Figure 20–4. Photo. Emergency vehicle access should always be considered when incorporating traffic–calming measures. Bumps, humps, and other raised pavement areas. Reduced street areas (where motor traffic is given priority). Surface texture and visual devices. Traffic calming on a major road. Speed hump (see figure 20–5). Raised crosswalk (see figures 20–6 and 20–7). Figure 20–5. Photo. Speed humps can be combined with curb extensions and a winding street alignment. Figure 20–6. Photo. Where possible, cyclists should be provided with cycle slips that enable them to bypass speed humps. Figure 20–7. Photo. Raised crosswalks can slow traffic and give pedestrians a level surface at the crossing. Table 20–1 contains brief descriptions of each treatment and design considerations. Table 20–1. Description of bumps, humps, and other raised areas. A raised area in the roadway pavement surface extending transversely across the travel way. Generally has a height of 7.6 to 15.2 cm (3 to 6 in) and a length of 0.3 to 1 m (1 to 3 ft). Most effective if used in a series at 91.4– to 152.4–m (300– to 500–ft) spacing. Typically used on private property for speed control—parking lots, apartment complexes, private streets, and driveways. Not conducive to bicycle travel and may not be pedestrian accessible. A raised area in the roadway pavement surface extending transversely across the roadway. Normally has a minimum height of 7.6 to 10.1 cm (3 to 4 in) and a travel length of approximately 3.7 m (12 ft). May raise the roadway surface to the height of the adjacent curb for a short distance. Can be round or flat–topped; the flat–topped configuration is sometimes called a speed table. Can extend the full width of the road or curb to curb, or can be cut back at the sides to allow bicycles to pass and facilitate drainage. A single hump acts as only a point speed control. To reduce speeds along an extended section of street, a series of humps is usually needed. Typically, speed humps are spaced at between 91.4 and 182.8 m (300 and 600 ft) apart. If midblock pedestrian crossings exist or are planned, they can be coordinated with speed hump installation since vehicle speeds will be lowest at the hump to negotiate ramps or curbs between the sidewalk and the street. Must be visible at night. Should be located to avoid conflict with underground utility access to boxes, vaults, and sewers. Should not be constructed at driveway locations. May be constructed on streets without curbs, but steps should be taken to prevent circumnavigation around the humps in these situations. Adequate signing and marking of each speed hump is essential to warn roadway users of the hump’s presence and guide their subsequent movements. Should not be installed in street sections where transit vehicles must transition between the travel lane and curbside stop. To the extent possible, speed humps should be located to ensure that transit vehicles can traverse them perpendicularly. Essentially a broad, flat–topped speed hump that coincides with pedestrian crosswalks at street intersections. Raised above the level of the roadway to slow traffic, it enhances crosswalk visibility and makes the crossing easier for pedestrians who may have difficulty stepping up and down curbs. Must be stable and firm and can be constructed of brick, concrete block, colored asphalt, or cement, with ramps striped for better visibility. On roadways with vehicular speeds perceived as being incompatible with the adjacent residential land uses. Where there are a significant number of pedestrian crossings. In conjunction with other traffic–calming devices, particularly entry treatments. On residential streets of two lanes or less that are classified as either local streets or neighborhood collector streets. On roadways with 85th percentile speeds less than 72 km/h (45 mi/h). Raises the roadway at an intersection, forming a type of plateau across the intersection, with a ramp on each approach. Situated at curb level, a plateau can be enhanced through the use of distinctive surfacing such as pavement coloring, brickwork, or other pavements. In some cases, the distinction between roadway and sidewalk surfaces is blurred. If this is done, physical obstructions such as bollards or planters should be considered, restricting the area to which motor vehicles have access. Ramps should not exceed a maximum gradient of 16 percent. Raised and/or textured surfaces can be used to alert drivers to the need for particular care. Distinctive surfacing helps reinforce the concept of a calmed area and thus plays a part in reducing vehicle speeds. Distinctive surfacing materials should be skid–resistant, particularly on inclines. Ramps should be clearly marked to enable bicyclists to identify and anticipate them, particularly under conditions of poor visibility. Care must be taken so the visually impaired have adequate cues to identify the roadway’s location (e.g., tactile strips). Color contrasts will aid those who are partially sighted. Table 20–2 below provides the findings for a before–and–after study of speed humps installed in Bellevue, WA, in order to reduce speeds in the area. Table 20–2. Bellevue, WA, speed hump findings. Two–way streets can be narrowed in a short distance, forcing motorists to slow and, in some cases, to merge into a single lane. Street narrowing is also referred to as neck–downs, traffic throttles, or pinch points. Sometimes these are used in conjunction with a speed table and coincident with a pedestrian crossing. One–Lane Slow Point. One–lane slow points restrict traffic flow to one lane (see figure 20–8). This lane must accommodate motor traffic in both travel directions. Passage through the slow point can be either straight through or angled. Figure 20–8. Illustration. Examples of one–lane and two–lane slow points. Where slow points have been used in isolation as speed control measures, bicyclists have felt squeezed as motorists attempt to overtake them at the narrowing. Not all bicyclists have the confidence to position themselves in the middle of the road to prevent overtaking on the approach to and passage through the narrow area. To reduce the risk of bicyclists’ being squeezed, slow points should generally be used in conjunction with other speed control devices such as speed tables at the narrowing. Slower moving drivers will be more inclined to allow bicyclists through before trying to pass. Where bicycle flows are high, consideration should be given to a separate right–of–way for bicyclists past the narrow area. A textured surface such as smooth brick or pavers may be used to emphasize pedestrian crossing movement. Substituting this for the normal roadway surface material may also help to impress upon motorists that lower speeds are intended. Such measures should not confuse pedestrians with respect to the boundary of the roadway area over which due care should still be taken. In particular, where a road is raised to the level of the adjacent sidewalk, this can cause problems for those with poor sight. However, a tactile strip may help blind people in distinguishing between the roadway and the sidewalk; similarly, a color variation will aid those who are partially sighted. Slow points can be used to discourage use of the street by large vehicles. They can, however, be barriers to fire trucks and other emergency vehicles. Some designs permit access by emergency vehicles by means of lockable posts or ramped islands. Slow points can enhance the appearance of the street. For example, landscaped islands can be installed, intruding into the roadway to form a narrow gate through which drivers must pass. Landscaping enhances the neighborhood’s sense of nature and provides a visual break in views along the street. Slow points are generally only sanctioned where traffic flows are less then 4,000 to 5,000 vehicles per day. Above this level, considerable delays will occur during peak periods. Clear signing should indicate traffic flow priorities. Table 20–3 displays the advantages and disadvantages of both one–lane and two–lane slow points. Table 20–3. Advantages and disadvantages of slow points. Most effective when used in a series. Imposes minimal inconvenience to local traffic. Pedestrians have a reduced crossing distance and greater safety. Reduced sight distances if landscaping is not low and trimmed. Contrary to driver expectations of unobstructed flow. Can be hazardous for drivers and bicyclists if not designed and maintained properly. Opposing drivers arriving simultaneously can create confrontation. Only a minor inconvenience to drivers. Regulates parking and protects parked vehicles as the narrowing can help stop illegal parking. Not very effective in slowing vehicles or diverting through traffic. Only partially effective as a visual obstruction. Medians are islands located along the roadway centerline, separating opposing directions of traffic movement. They can be either raised or flush with the level of the roadway surface. They can be expressed as painted pavement markings, raised concrete platforms, landscaped areas, or any of a variety of other design forms. 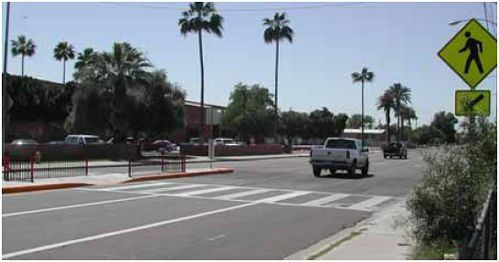 Medians can provide special facilities to accommodate pedestrians and bicyclists, especially at crossings of major roadways (see figure 20–9). Figure 20–9. Photo. This median refuge island provides railing and a staggered crossing area to direct pedestrian views toward oncoming traffic. Medians are most valuable on major, multilane roads that present safety problems for bicyclists and pedestrians wishing to cross. The minimum central refuge width for safe use by those with wheelchairs, bicycles, baby buggies, etc., is 1.6 m (5.2 ft) (2 m [6.6 ft] is desirable). Where medians are used as pedestrian and bicyclist refuges, internally illuminated bollards are suggested on the medians to facilitate quick and easy identification. Used in isolation, roadway medians do not have a significant impact in reducing vehicle speeds. For the purpose of slowing traffic, medians are generally used in conjunction with other devices such as curb extensions or roadway lane narrowing. To achieve meaningful speed reductions, the travel lane width reduction must be substantial and visually obvious. The slowing, however, is temporary; as soon as the roadway widens again, traffic resumes its normal speed. Bicyclists are put at risk of being squeezed where insufficient room has been left between a central median and the adjacent curb. Experience shows that most drivers are unlikely to hold back in such instances to let bicyclists go through first. This threat is particularly serious on roads with high proportions of heavy vehicles. The contradiction between the need to reduce the roadway width sufficiently to lower motorist speeds, while at the same time leaving enough room for bicyclists to ride safely, must be addressed. This may be achieved by reducing the roadway width to the minimum necessary for a bicyclist and a motorist to pass safely (i.e., 3.5 m [11.5 ft]). Introducing color or texture changes to the road surface material around the refuge area reminds motorists to reduce speed. 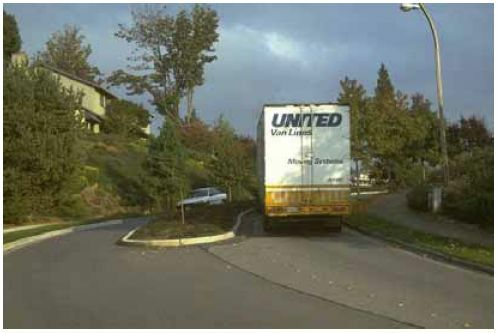 White striping gives a visual impression that vehicles are confined to a narrower roadway than that created by the physical obstruction—adjacent areas exist that vehicles can run over, but these are not generally apparent to approaching drivers. In some cases, provide an alternate, cut–through route for bicyclists (see figure 20–6). The sidewalk and/or landscaped area on one or both sides of the road is extended to reduce the roadway to a single lane or minimum–width double lane. By reducing crossing distances, sidewalk widening can be used to make pedestrian movement easier and safer. They can be installed either at intersections or midblock. They may be used in conjunction with other traffic–calming devices. They are limited only to the degree that they extend into the travelway, but they cannot impede or restrict the operation of the roadway. Successful bicycle facilities need a clear separation from sidewalk and street pavement, with adequate distances from parked cars to avoid opening doors. Cross –traffic should be slowed to allow bicyclists better continuity and safety. Narrowing certain streets can, at the same time, create safer bicycle facilities, but care should be taken that bicyclists are not squeezed by overtaking vehicles where the road narrows. Encouraging motorists to let the bicyclists through first by using complementary traffic–calming techniques such as speed tables and cautionary signing or by leaving sufficient room for both to pass safely at the narrowing would be appropriate measures. If it is expected that a motorist should be able to pass a bicyclist, the minimum desirable width is 3.5 m (11.5 ft). Curb extensions can be employed to facilitate bicycle movement where a segregated multiuse trail crosses a busy street. Corner radii of intersection curbs are reduced, forcing turning vehicles to slow down. Efforts to accommodate trucks and other large vehicles have historically led to increased corner radii at intersections. To slow traffic, a corner radius of approximately 2.1 m (7 ft) is recommended (see figure 20–10). Figure 20–10. Photo. A reduced radius allows for a slower, safer turn. Large vehicles (trucks, vans, etc.) have more difficulty negotiating reduced radius corners. Pedestrian crossing distances are reduced by up to 1.2 m (4 ft) when the radius is reduced (see figure 20–11). The sharper turns that result from the reduced radii require motorists to reduce speed, increasing the time available to detect and take appropriate actions related to pedestrians at the crossing. Smaller radii provide more pedestrian storage space, and pedestrians are more visible to drivers. Figure 20–11. Illustration. When turning radii are reduced, the width of an intersection is reduced as well. Especially in residential areas, wide streets may not be necessary or desirable. Wide traffic lanes encourage faster motor vehicle speeds. Consideration should be given to the review of cross–sections for all street classifications to determine whether roadway lane widths can be reduced (within the AASHTO guidelines) so more area can be dedicated to bicycle and pedestrian use and associated traffic–calming facilities (see figure 20–12). Cross–section approaching the reduced–width street should also be slowed. Figure 20–12. Photo. This traffic–calming measure uses a landscaped median to narrow the travel lanes. Table 20–4. Advantages and disadvantages of corner radius and narrowed lane treatments. Can result in increased safety for pedestrians by reducing crossing distances and slowing the speed of turning vehicles. May result in wide swings in turning movements of large vehicles. May result in large vehicles hitting and damaging curbs or endangering pedestrians on corners. May affect response times for emergency vehicles. Additional area for landscaping and pedestrian facilities. Reduced vehicle speeds and increased safety. On–street parking may be restricted. Caution: Street closures must be considered in an areawide context, or traffic problems may simply shift to another nearby street. Where proposals are likely to lead to a reduction in access, prior consultation with residents at early stages of planning and design is especially important to minimize opposition. The benefits of exempting bicyclists should be carefully considered in all cases. Bicycle gaps should be designed to minimize the risk of obstruction by parked vehicles. Painting a bicycle symbol and other directional markings on the road in front of the bicycle gap has proven to be effective. Bollards can reduce the parking obstruction (see figure 20–13). Bollards should be lighted or reflectorized to be visible at night. The design of bicycle gaps should permit good visibility of adjacent roads. Signing should acknowledge the continued route as a through–route for bicyclists. Clearly defined parking can reduce the problem of parked cars blocking the closure and bicycle gap. Police and fire departments should be consulted early in the design process to determine emergency access requirements. Often, removable bollards, crash gates, and card or key–operated gates can satisfy these requirements, combined with parking restrictions. A 6.1–m–wide (20–ft–wide) clear path is needed for emergency access. Tree planting, benches, and textured paving can enhance appearance. Street closures are recommended only after full consideration of all expected turning and reversing movements, including those of garbage trucks, fire trucks, and other large vehicles. Figure 20–13. Photo. The design of street closures should provide specific parking areas to discourage obstruction of bicycle and pedestrian traffic. As a general rule, bicycle and pedestrian exemptions should be provided and designed to minimize the likelihood of obstruction by parked vehicles. All signing should acknowledge the continued existence of a through–route for bicyclists and pedestrians. A driveway link is a partial street closure in which the street character is significantly changed so it appears to be a private drive. Typically, the roadway is narrowed and defined with textured or colored paving. A ribbon curb, landscaping, or bollards may be used to delineate roadway edges. Reclaimed roadway area is converted to pedestrian facilities and landscaping. This is a very effective method of changing the initial impression of the street. If done right, drivers will not be able to see through. It appears as a road closure, yet allows through traffic. The driveway link can provide access to small groups of homes and is especially applicable to planned residential developments. The go–slow feel of the driveway link is enhanced by design standards that eliminate vertical curb and gutter and use a relatively narrow driveway cross–section. Traffic diverters are physical barriers installed at intersections that restrict motor vehicle movements in selected directions. The diverters may be designed to prevent right– or left–hand turns, to block straight–ahead travel and force turns to the right or left, or to create a T–intersection. In all cases, paths, cut–throughs, or other provisions should be made to allow bicyclists and pedestrians access across the closure. Traffic diverters can take many forms. In diagonal road closures and diversions, straight–through traffic movements are prohibited (see figure 20–14). Motorists are diverted in one direction only. Seattle, WA, installed truncated diagonal diverters, which allow right–turn movements around one end of the diverter. That city’s engineering department found that these diverters disrupted neighborhood traffic and has focused instead on installation of traffic circles to control neighborhood traffic problems. Problems experienced with diverters included: (1) travel time and distance increased for all users; (2) local residents were diverted to other streets; (3) visitors and delivery services were often confused and delayed; and (4) emergency vehicle response times were potentially increased. Bollard design has evolved, and the technology exists to provide access to select groups by using remote devices to lower the bollards. Limiting access may require agency policies to admit only the select vehicles. Figure 20–14. Photo. Diagonal road closures/diverters limit vehicular access but allow emergency vehicles to enter through removable bollards. Turning movement diverters are installed at the intersection of a neighborhood street with a major street or collector to prevent cut–through traffic. They prevent straight–through movements and allow right turns only into and out of the neighborhood. Table 20–5. Advantages and disadvantages of diverters. An area for landscaping is provided. A bicycle pathway connection can be included. Will inconvenience residents in gaining access to their properties. May inhibit access by emergency vehicles unless they are permitted access or the street names are changed. Will move through traffic to other streets if not back to the arterial. Effective at discouraging cut–through traffic. Creates sense of neighborhood entry and identity. Limits resident access. Should be installed as part of overall neighborhood circulation improvements to ensure reasonable convenience for residents. Motorists may try to override the diverter to make prohibited turns unless vertical curbs, barriers, landscaping, or other means are used to discourage such actions. Large traffic circles, or rotaries, with two or more lanes, have a history of high speeds, public confusion as to yield regulations, and high crash rates. They are generally not regarded well by the U.S. public. However, smaller traffic circles, with center islands approximately 4.0 m (13 ft) in diameter, can be safer for both vehicles and pedestrians. They can be used as traffic–calming devices at intersections and are effective in reducing vehicle speeds (see figure 20–15). Traffic circles can reduce crashes by 50 to 90 percent (when compared to two–way and four–way stop signs and other traffic signs) by reducing the number of conflict points at intersections. Success, however, depends on the central island being sufficiently visible and the approach lanes engineered to deflect vehicles, preventing overrun of the island. Traversable traffic circles on straight roads are less likely to produce the desired speed reduction. The discussion below on roundabouts also applies to small roundabouts, specifically their advantages and disadvantages. Figure 20–15. Photo. Traffic circles can be designed to accommodate large vehicles and emergency access without undue restrictions. 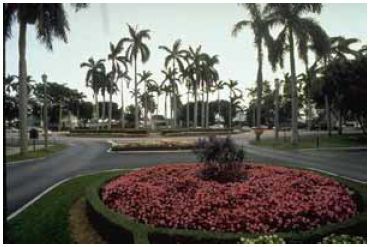 Traditionally, distinctions between modern roundabouts and other kinds of circular intersections, such as rotaries or traffic circles, are not always clear. Table 20–6 provides a breakdown of the differences between traffic circles and modern roundabouts. This table was adapted from the FHWA report, Roundabouts: An Informational Guide. (2) Like traffic circles, roundabouts vary in size and number of lanes they accommodate. Table 20–7 shows the advantages and disadvantages of roundabouts. These conditions can change with the size and configuration of the roundabout. Table 20–6. Comparison of roundabouts with traffic circles. Yield control is used on all entries. The circulatory roadway has no control. Some traffic circles use stop control or no control, on one or more entries. Circulating vehicles have the right of way. Some traffic circles require circulating vehicles to yield to entering traffic. Pedestrian access is allowed only across the legs of the roundabout, behind the yield line. Some traffic circles allow pedestrian access to the central island. All vehicles circulate counterclockwise and pass to the right of the central island. Some neighborhood traffic circles allow left–turning vehicles to pass to the left of the central island. No parking is allowed within the circulatory roadway or at the entries. Some traffic circles allow parking within the circulatory roadway. Table 20–7. Advantages and disadvantages of roundabouts. There are a reduced number of conflict points compared to uncontrolled intersection. Lower operational speeds yield less severe and fewer crashes. Slower speeds because of intersection geometry reduce crashes. Since roundabouts are unfamiliar to the average driver in the United States, there is likely to be an initial period where crashes increase. Signalized intersections can preempt control for emergency vehicles. Traffic yields rather than stops, often resulting in the acceptance of smaller gaps. For isolated intersections, roundabouts should give higher capacity/lane than signalized intersections due to the omission of lost time (red and yellow) at signalized intersections. Where the coordinated signal network can be used, a signalized intersection will increase the overall capacity of the network. Signals may be preferred at intersections that periodically operate at higher than designed capacities. Overall delay will probably be less than for an equivalent volume signalized intersection (this does not equate to a higher LOS). During the off–peak, signalized intersections with no retiming produce unnecessary delays to stopped traffic when gaps on the other flow are available. Drivers may not like the geometric delays which force them to divert their cars from straight paths. When queuing develops, entering drivers tend to force into the circulating streams with shorter gaps. This may increase the delays on other legs and the number of crashes. In general, less right–of–way is required. Maintenance costs of signalized intersections include electricity, maintenance of loops, signal heads, controller, timing plans (roundabout maintenance includes only landscape maintenance, illumination, and occasional sign replacement). Crash costs are low due to the low number of crashes and severity. Construction costs may be higher. In some locations, roundabouts may require more illumination, increasing costs. 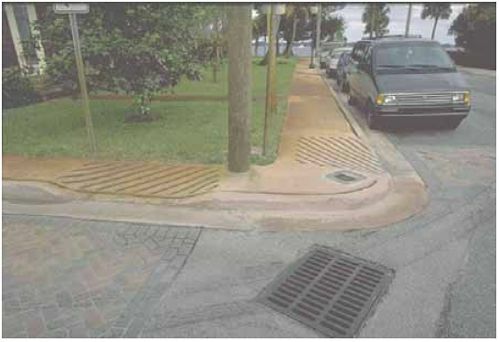 A splitter island provides a refuge for pedestrians that will increase safety. At low speed and low traffic volume, roundabouts should improve safety for bicyclists. A splitter island may cause difficulty to people using wheelchairs. Tight dimensions of roundabouts create an uncomfortable feeling to bicyclists. Longer paths increase travel distances for both pedestrians and bicyclists. Roundabouts may increase delay for pedestrians seeking acceptable gaps to cross. A roundabout is a channelized intersection at which all traffic moves counterclockwise around a central traffic island. These islands may be painted or domed, mountable elements may be curbed, and islands may also include landscaping or other improvements. Roundabouts were most commonly used on streets with speed limits of 48 km/h (30 mi/h) or less. Roundabouts were found to have a far lower overall crash rate than that of signalized intersections with equivalent speed limits. Looking only at crashes involving bicycles, the study showed that four–arm roundabouts have about the same involvement rate (crashes per million vehicles of that type entering the intersection) as do conventional, four–legged, signalized intersections. Table 20–8. Comparative crash rates for signalized intersections and roundabouts. 34 crashes per 100 million vehicles. 20% resulted in serious or fatal injury. 20 crashes per 100 million vehicles. 19% resulted in serious or fatal injury. *Note: Both types of intersections compared have 48–km/h (30–mi/h) speed limits and are four–legged intersections. Splitter islands are the islands placed within legs of the roundabout to separate entering and exiting traffic. They are designed to deflect entering traffic (see figure 20–16) and prevent hazardous, wrong–way turning movements. Figure 20–16. Photo. The splitter islands should be raised and landscaped to prevent left–turning vehicles from taking a shortcut across the island. Roundabouts should preferably have sufficiently raised and highly visible centers to ensure that motorists use them, rather than overrunning. Complementary speed reduction measures such as road humps on the approach to roundabouts can improve safety. The design of roundabouts must ensure that bicyclists are not squeezed by other vehicles negotiating the feature. Yet, where possible, adequate deflection must be incorporated on each approach to enforce appropriate entry speeds for motor vehicles. There has been discussion of how usable roundabouts are to all pedestrians, depending on the size of the roundabout. Pedestrian gap acceptance is difficult due to the unknown intention of the vehicle traveling around the circle (will they exit the circle or keep going to another approach?). However, initial evidence shows lower pedestrian crashes which may be due to lower speeds and reduced conflict points, and NCHRP project 3–78 is investigating the safety experience of roundabouts . The Seattle, WA, Engineering Department (now known as the Seattle Department of Transportation) has experimented since the 1960s with a variety of neighborhood traffic control devices. The major emphasis of this Department’s Neighborhood Traffic Control Program is installing roundabouts at residential street intersections. City staff report that about 30 roundabouts are built each year. A total of approximately 400 roundabouts have been installed to date. Each one costs about $5,000 to $6,000. 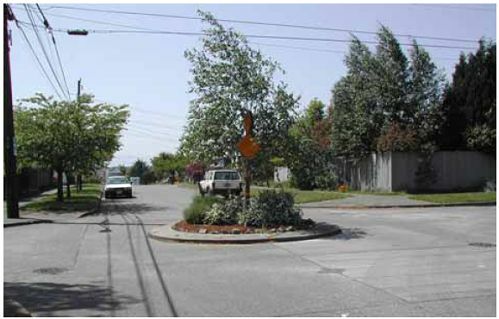 In Seattle, a roundabout is an island built in the middle of a residential street intersection. Each one is custom–fitted to the intersection’s geometry; every roundabout is designed to allow a single–unit truck to maneuver around the central island without running over it. A 0.6–m (2–ft) concrete apron is built around the outside edge of the roundabout to accommodate larger trucks. The center island is generally 4.6 m (15 ft) in diameter. Large trucks, when maneuvering around the roundabout, may run over the apron. The interior section of the island is usually landscaped. The Seattle Engineering Department coordinates the design and construction of each roundabout with the Seattle Fire Department and school bus companies. Roundabouts are installed at the request of citizens and community groups. Because there are more requests than funding to build them, the Seattle Engineering Department has created a system for evaluating and ranking the requests. Before a request can be evaluated, a petition requesting a roundabout must be signed by 60 percent of the residents within a one–block radius of the proposed location. Then, the intersection’s collision history, traffic volume, and speeds are studied. Chicanes are barriers placed in the street that require drivers to slow down and drive around them. The barriers may take the form of landscaping, street furniture, parking bays, curb extensions, or other devices (see figure 20–1). Reduction of traffic volumes on the demonstration streets. Little increase in traffic on adjacent residential streets. Reduction of motor speeds and collisions. Strong support for permanent installation of chicanes by residents (68 percent). In the interest of safe bicycle travel, bicycle bypasses and signs to indicate directional priority are suggested. A reduction in sight lines should not be used in isolation to reduce speeds; if used alone, this could be dangerous. Reduced sight lines may be appropriate to avoid excessive land taking or as a reinforcing measure only where other physical features are employed to reduce speed. Chicanes offer a good opportunity to make environmental improvements through planting. However, preference should be given to low–lying or slow– growing shrubs to minimize maintenance and ensure good visibility. Measures should be employed to ensure that chicanes are clearly visible at night. Where full closure or speed humps are not feasible, chicanes may be used to reduce traffic speeds. Many different layouts are possible, including staggered parking (on alternating sides of the road). Designers should be aware of the need for accessibility to residential properties, both in terms of servicing and the needs of the individual. Tortuous roads will prove to be unpopular if they severely restrict accessibility. Where traffic is deliberately diverted onto a tortuous route—to avert town center congestion, for example—consider maintaining as direct a route as possible for bicyclists. Curvilinear roads (a.k.a., serpentines) are under study, but have not yet been approved, for use in Portland, OR. If approved, their use would be limited to residential streets of two or fewer lanes. Road design is limited by AASHTO standards for transition taper lengths. This traffic–calming device may require significant parking removal and should be used where parking removal is not an issue. This category of traffic–calming devices includes signing, pavement marking, colored and textured pavement treatments, and rumble strips. These devices provide visual and audible cues about the traffic calmed area. Colors and textures that contrast with those prevailing along the roadway alert motorists to particular conditions, much as conspicuous materials increase bicyclist and pedestrian visibility. Signs and pavement markings also provide information about applicable regulations, warnings, and directions. Installation of directional, warning, and informational signs and pavement markings should conform to the MUTCD guidelines, as applicable (see figure 20–17). Traffic–calming devices may be new to many people in the United States, and the signs and markings will help minimize confusion and traffic conflicts. Figure 20–17. Photo. These pavement markings at a median refuge delineate the crossing for motorists and provide visible cues to sighted pedestrians as to the location of the roadway edge. A part of the sign/pavement marking approach to mitigating traffic in residential areas includes painting of stripes/lines on the roadway and other patterns that are designed to have a psychological impact on drivers. Although such patterns are basically intended to slow vehicles rather than reduce traffic, they should make passage over residential streets less desirable than if the roadway were untreated, in effect, encouraging the use of alternative routes. Many of the patterns tried have had only marginal success. In a few cases, the average speed increased slightly. A pattern that is successful is that of painting transverse bands. Painted lines are applied to the road at decreasing intervals approaching an intersection or "slow–down" point. They are intended to give the impression of increasing speed and motorists react by slowing down. In Drachten, The Netherlands, engineers are experimenting with removing all traffic signs and markings at intersections, thus forcing each vehicle, bicycle, and pedestrian movement to be negotiated individually toward a result of lower speeds and fewer crashes. 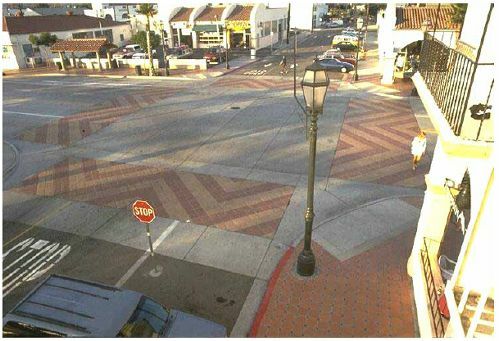 The use of paving materials such as brick, cobbles, concrete pavers, or other materials that create variation in color and texture reinforces the identity of an area as a traffic–restricted zone (see figure 20–18). Detectable markings are also used at curb ramps, blended transitions, raised crossings, etc. Figure 20–18. Photo. Pavement treatments can be applied to the entire traffic–calmed area or limited to specific street uses. The choice of materials should ensure that they do not pose a danger or deterrent to bicyclists or persons with disabilities. Cobbles present special difficulties, particularly for vehicles with narrow wheels and without the benefit of suspension. Such treatment is particularly discouraging for bicyclists on steep slopes, making it harder to maintain momentum when riding uphill. Thus, as a general rule, cobbles should not be employed. Similarly, pavers with chamfered edges impair a bicyclist’s stability and should be avoided. The color and texture of the street surface are important aspects of the attractiveness of many residential streets. The variation from asphalt or concrete paving associated by most people with automobile territory signals to the motorist that he or she has crossed into a different residential zone where pedestrians and bicyclists can be expected to have greater priority. Chapter 5 of the ITE report, titled Traffic Calming: State of the Practice, contains a synthesis of traffic–calming impacts experienced in the United States and Canada. (1) The report draws from detailed information collected on traffic–calming programs in 20 featured communities, another 30 communities surveyed less extensively, and a parallel Canadian effort by the Canadian ITE and the Transportation Association of Canada. The following information and tables were derived exclusively from this source. Naturally, reducing traffic speeds is one of the primary goals of traffic calming. Table 20–9 includes a list of several traffic–calming devices used and the impact they have on the speeds downstream of the traffic measure. Note that, due to the limitations of the studies, the data presented in table 20–9 are case–specific and represent only ballpark estimates of general traffic–calming impacts. Table 20–9. Speed impacts downstream of traffic–calming measures. The effectiveness of traffic calming measures is also judged by impacts on traffic volumes. Volume impacts are much more complex and case–specific than are speed impacts. They depend on the entire network of which a street is a part, not just on the characteristics of the street itself. The availability of alternative routes and the application of other measures in areawide schemes may have as large an impact on volumes as do the geometrics and spacing of traffic calming measures. In particular, volume impacts depend fundamentally on the split between local and through traffic. This split also affects speeds, but to a lesser degree. Traffic calming measures will not affect the amount of locally bound traffic unless they are so severe or restrictive as to "degenerate" motor vehicle trips. What traffic calming measures may do is to reroute nonlocal traffic. Measures fall into three classes: those that preclude through traffic, which will be referred to as class I measures; those that discourage but still allow through traffic—class II measures; and those that are neutral with respect to through traffic other than to slow it down–class III measures. Where individual measures fit into this scheme will, as already noted, be case–specific. It will depend on geometrics and spacing, quality of alternative routes, and other factors. Still, there may be some value in generalizing about diversion potential. Portland, OR, reports more diversion with [4.27–m] 14–foot humps than [6.71–m] 22–foot tables, and more diversion with either than with traffic circles. San Diego, CA, and Seattle, WA, report significant diversion with standard [3.66–m] 12–foot humps but minimal diversion with traffic circles. In terms of the three classes defined above, speed humps appear to be class II measures, discouraging but still allowing through traffic. If a good alternative route exists, humps will divert through trips in substantial numbers. Traffic circles appear to be class III measures, causing minimal diversion even where good alternative routes exist. Speed tables [6.71 m (22 ft) and up] could fall into either class; diversion information is too limited to be sure. Table 20–10 provides quantitative volume impacts of traffic–calming measures. Table 20–10. Volume impacts of traffic–calming measures. Perhaps the most compelling effect of traffic calming is in the area of safety. By slowing traffic, eliminating conflicting movements, and sharpening drivers’ attention, traffic calming may result in fewer collisions. And, because of lower speeds, when collisions do occur, they may be less serious. What makes positive safety impacts so important is that opposition to traffic calming is often based principally on safety concerns and concerns related to emergency response. It may be difficult to determine the safety impacts of a traffic–calming program. For a comprehensive view of the safety impact, it is important to examine a wide area, including streets with and without traffic calming. 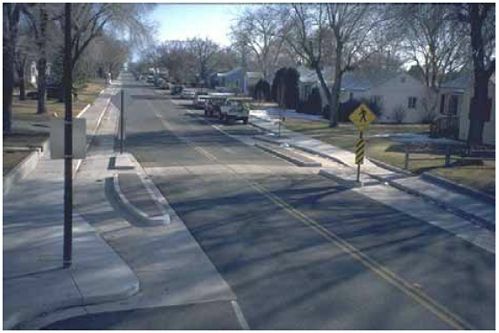 Crime reduction: Traffic calming encourages natural surveillance and access control. Quality of street life: Lower speeds and volumes after traffic calming encourage walking, bicycling, and street life. Rise in property value: Traffic calming eliminates or lessens negative externalities of motor vehicle use. Noise reduction: Due to a decrease in traffic speeds, noise is reduced. 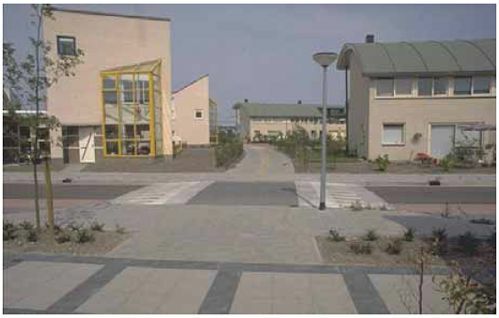 A woonerf (Dutch for "living yard") combines many of the traffic–calming devices just discussed to create a street where pedestrians have priority, and the line between motor–vehicle space and pedestrian (or living) space is deliberately blurred (see figure 20–19). The street is designed so motorists are forced to slow down and exercise caution. Drivers, the Dutch say, do not obey speed limit signs, but they do respect the design of the street. 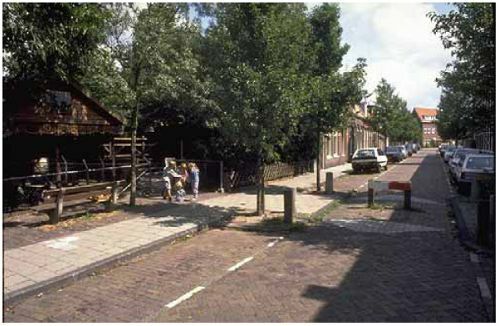 The woonerf (plural—woonerven) is a concept that emerged in the 1970s as planners gave increased emphasis to residential neighborhoods. People recognized that many residential streets were unsafe and unattractive and that the streets, which took up a considerable amount of land area, were used for nothing but motor vehicle access and parking. Most of the time, the streets were empty, creating a no–man’s–land separating the homes from one another. The Dutch, in particular, experimented extensively with street design concepts in which there was no segregation between motorized and nonmotorized traffic and in which pedestrians had priority. Figure 20–19. Illustration. Model of a woonerf. Nonmotorized users assessed woonerven more positively than motorized users. Feedback from residents living on woonerven was very positive. They appreciated the low traffic volumes and absence of cut–through traffic, but considered the larger play areas and other improvements to the street environment to be even more important benefits. Following evaluation of the woonerven, the Dutch law was amended (July 1988) to allow greater design flexibility and replaced the design rules with six basic principles. The main function of the woonerf shall be for residential purposes. Thus, roads within the "erf" area may only be geared to traffic terminating or originating from it. The intensity of traffic should not conflict with the character of the woonerf in practical terms: conditions should be optimal for walking, playing, shopping, etc. Motorists are guests. Within woonerven, traffic flows below 100 vehicles per hour should be maintained. To slow traffic, the nature and condition of the roads and road segment must stress the need to drive slowly. Particular speed–reduction features are no longer mandated, so planners can utilize the most effective and appropriate facilities. The entrances and exits of woonerven shall be recognizable as such from their construction. They may be located at an intersection with a major road (preferable) or at least 20 m (60 ft) from such an intersection. The impression shall not be created that the road is divided into a roadway and sidewalk (see figure 20–20). 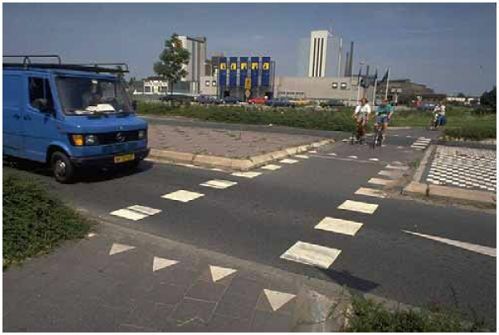 Therefore, there shall be no continuous height differences in the cross–section of a road within a woonerf. Provided this condition is met, a facility for pedestrians may be realized. Thus, space can be designated for pedestrians and a measure of protection offered, for example, by use of bollards or trees. The area of the road surface intended for parking one or more vehicles shall be marked at least at the corners. The marking and the letter "P" shall be clearly distinguishable from the rest of the road surface. In shopping street "erfs" (winkelerven), special loading spaces can be provided, as can short–term parking with time limits. Informational signs may be placed under the international "erf" traffic sign to denote which type of "erf" is present. Figure 20–20. Photo. The distinctions between sidewalks and roadways are blurred in woonerfs. Traffic–calming devices can be combined to provide an entry or gateway into a neighborhood or other district, reducing speed though both physical and psychological means. Surface alterations at intersections with local streets can include textured paving, pavement inserts, or concrete, brick, or stone materials. At the entry, the surface treatment can be raised as high as the level of the adjoining curb. Visual and tactile cues let people know that they are entering an area where motor vehicles are restricted. Eugene, OR, installs curb extensions at entrances to neighborhood areas, usually where a residential street intersects an arterial. The curb extension is placed to prevent motor vehicle traffic from cutting through the neighborhood. The curb extension is signed as a neighborhood entrance or exit. Most of the street remains two–way, but one end becomes a one–way street. Compliance by motor vehicles is mostly good. Bikes are allowed to travel both ways at all curb extensions. The City of Palo Alto, CA, has moved beyond spot traffic–calming treatments and has created bicycle boulevards—streets on which bicycles have priority. Throughways where bicycle movements have precedence over automobiles. Direct routes that reduce travel time for bicyclists. Safe travel routes that reduce conflicts between bicyclists and motor vehicles. Facilities that promote and facilitate the use of bicycles as an alternative transportation mode for all purposes of travel. The Palo Alto, CA, bicycle boulevard is a 2–mi stretch of Bryant Street, a residential street that runs parallel to a busy collector arterial. 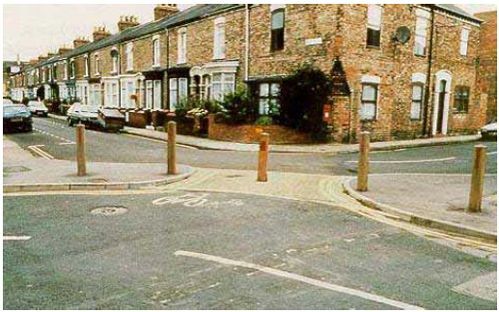 It was created in 1982 when barriers were fitted to restrict or prohibit through motor vehicle traffic, but to allow through bicycle traffic. In addition, a number of stop signs along the boulevard were removed. An evaluation after 6 months showed a reduction in the amount of motor vehicle traffic, a nearly twofold increase in bicycle traffic, and a slight reduction in bicycle traffic on nearby streets. The City also found that anticipated problems failed to materialize and concluded that a predominantly stop–free bikeway—on less traveled residential streets—can be an attractive and effective route for bicyclists. The bicycle boulevard bike traffic increased to amounts similar to those found on other established bike routes. The bicycle boulevard continues to function as a normal local city street, providing access to residences, on–street parking, and unrestricted local travel. The City received complaints about the visual appearance of the initial street closure barriers (since upgraded with landscaping), but is unaware of any other serious concerns of nearby residents. Plans for the extension of the bicycle boulevard through downtown Palo Alto, CA, were approved by the City Council in the summer of 1992. Included in this extension was the installation of a traffic signal to help bicyclists cross a busy arterial. The Seattle Engineering Department is changing some of Seattle, WA, streets from four lanes to two lanes with a center left–turn lane. These channelization changes can provide extra room for bicycle lanes or a wide lane for cars and bikes to share (see figure 20–21). Figure 20–21. Illustration. The conversion of a four–lane roadway—the elimination of one travel lane in each direction creates space for bicyclists. Numerous comments from users of some of those streets say motor vehicle speeds seem to have decreased. One street in particular, Dexter Avenue North, is a popular commuting route to downtown Seattle, WA, for bicyclists. Traffic counts on the street show bicyclists make up about 10 to 15 percent of the traffic at certain times during the day. The rechannelization had little or no effect on capacity, reduced overtaking crashes, and made it easier for pedestrians to cross the street (by providing a refuge in the center of the road). Choose a site–specific location (such as two to three blocks of a local street) where fast traffic or shortcuts are a problem. Conduct a site analysis to determine problems. Prepare a detailed site solution that incorporates several traffic–calming devices. Illustrate with drawings and describe the anticipated changes in traffic speed. Prepare a traffic–calming solution for an entire neighborhood or downtown area that illustrates an area–wide approach to slowing traffic. Conduct a site analysis to determine problem areas. Illustrate your solutions and describe the anticipated changes in traffic speed and flow. 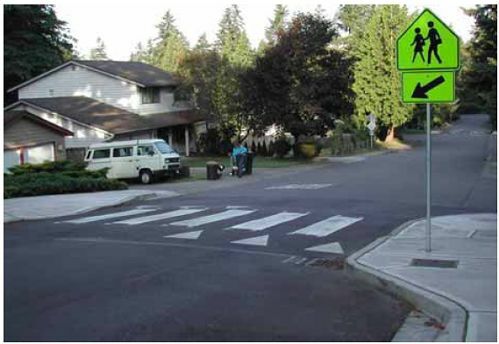 Traffic Calming: State of the Practice, ITE with FHWA, Publication No. FHWA–RD–99–135, McLean, VA, August 1999, available online at http://www.ite.org/traffic/tcstate.htm#tcsop, accessed April 22, 2004. 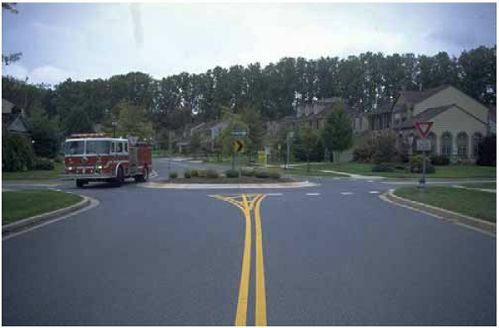 Roundabouts: An Informational Guide, FHWA, Publication No. FHWA–RD–00–067, McLean, VA, June 2000, available online at http://www.tfhrc.gov/safety/00–0671.pdf, accessed April 22, 2004. Modern Roundabouts for Oregon, Publication No. OR–RD–98–17, Oregon Department of Transportation, June 1998, available online at http://www.oregon.gov/ODOT/TD/TP_RES/docs/Reports/ModernRoundAbout.pdf, accessed April 22, 2004. 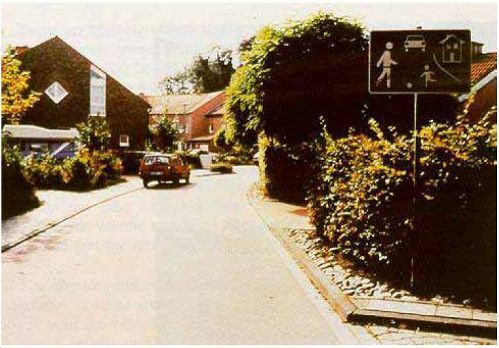 Hass–Klau, C., Illustrated Guide to Traffic Calming, Friends of the Earth, London, UK, 1990. "Case Study No. 19: Traffic Calming, Auto–Restricted Zones, and Other Traffic Management Techniques—Their Effects on Bicycling and Pedestrians," National Bicycling and Walking Study, FHWA, 1994, available online at http://safety.fhwa.dot.gov/ped_bike/docs/case19.pdf, accessed April 22, 2004. Drake, B., and D. Burden, Pedestrian and Bicyclists Safety and Accommodation Participation Workbook, NHI Course No. 38061, FHWA–HI–96 –028, 1996. Ewing, R., and C. Kooshian, "U.S. 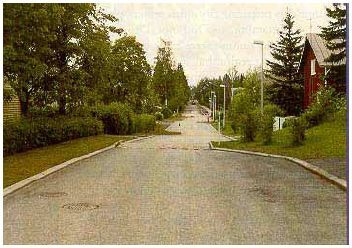 Experience With Traffic Calming," ITE Journal, August 1997, pp. 28–33, available online at http://tac.arlington.ma.us/references/survJHA97A28.pdf. Hoyle, C., "Traffic Calming," Planning Advisory Service Report No. 456, American Planning Association, 1995. 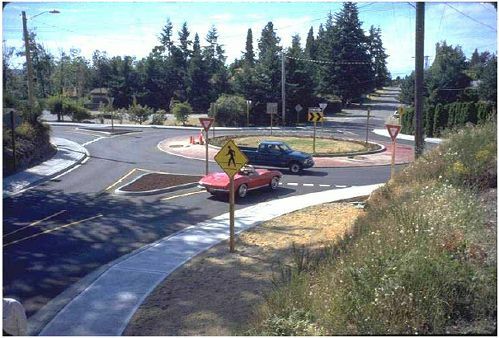 Modern Roundabout Practice in the United States, NCHRP Synthesis 264, TRB, 1998. Summary of a Proposed Recommended Practice—Guidelines for the Design and Application of Speed Humps, ITE, 1993, available online at http://www.ite.org/traffic/documents/JEA93A11.pdf.